While Nikki Garcia is vacationing with her fiancé Eduardo in Mexico, she gets a call from her boss asking her to go check out a kidnapping that just took place in San Miguel de Allende, Mexico. Putting their vacation on hold, Nikki and Eduardo take off to investigate. The missing child is ten-year-old Bibi Lombardi. Her mother Sofia, owns a restaurant in this small town. Due to police corruption, Sofia is afraid to notify the authorities. She suspects that her Italian ex-husband Paolo and his mother Chiara are responsible, as Chiara has done this in the past. Paolo believes that Sofia faked the kidnapping as a ruse to hide their daughter from him. It is up to Nikki to uncover the truth. Having to rely on a witness who does not appear helpful at first, Nikki soon realizes that the information given to her by a bag lady known as Juana la Marihuana seems to be accurate. Against everybody’s wishes, Nikki quickly goes undercover to find Bibi, putting her at risk with human traffickers. The truth will come out and it won’t be pretty. 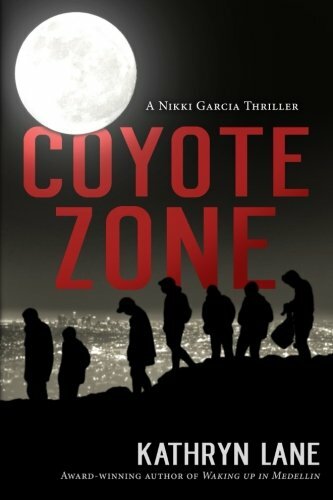 “Coyote Zone” is a dynamic thriller. The action is so fast-paced the reader never has a chance to catch their breath until the very end! Nikki is engaging and realistic, and I loved following right alongside her throughout the action. All the characters are well developed and most of them very likeable. Readers will have no problems hating the characters meant to be hated, particularly with the hefty subject matter Lane tackles. Human trafficking, especially involving children, is currently a huge issue, and the author does an excellent job of realistically portraying how it really happens. With bad people working on several sides, it is hard to figure out how this story is going to end until the actual end. Clues are given, but the plot keeps twisting and turning so the reader will have to wait until the last chapter to know for sure who the bad guy is. I love thriller/suspense novels like this because they make me feel like I am on a wild roller coaster ride! “Coyote Zone” by Kathryn Lane is highly recommended reading for fans of the genre. Intrigue, deception, kidnapping, romance – there is truly something for everyone in this exciting thriller. I cannot wait to read other novels by this author and I hope that she continues to write Nikki Garcia thrillers for a long time!